This is a natural herbal supplement designed to combat insomnia and foster a full, restful night of sleep, while also addressing restlessness, stress, and tension. It claims to contain a range of natural ingredients that are beneficial for aiding in a good night’s sleep and relieving stress. As this product is natural, it is not addictive. Valerian root is commonly prescribed for sleep disorders, but can also address conditions of anxiety, chronic stress, as well as headaches and upset stomach that result from stress. It acts as a sedative on the nervous system, calming both the body and the mind. Other ingredients are commonly used to treat tension, anxiety, and a variety of disorders related to stress, they often have a relaxing and uplifting effect that fosters a general sense of well-being. St, John’s Wort has been used in alternative medicine for a variety of conditions including chronic physical illness, mild depression, general and social anxiety, and insomnia. Black Cohosh is an interesting ingredient for a sleep aid as it is an herb most frequently prescribed to treat symptoms of menopause, but is becoming a popular alternative therapy to treat migraines, sleep disturbances, and mood problems. The company recommends taking two to four tablets one hour before bedtime, and more if needed. The manufacturer does not state any upper limit to not exceed, which may result in side effects if too much is consumed. St. John’s Wort should not be taken by women who are pregnant or breastfeeding. Additionally, if you are taking over-the-counter or prescribed medications for muscle relaxation or sleep, you should not take this supplement without first consulting a doctor. Other side effects of one or multiple of the listed ingredients include headaches, dizziness, upset stomach or heartburn, estrogen sensitivity, mild skin rash or increased sensitivity to sunlight. Through the company’s site, one bottle of 100 capsules is available for $14.00. It can be purchased on Amazon for $17.91. There appear to be no special offers or discounts for multi-bottle purchases. We were unable to find a product guarantee anywhere on the company’s website, but products purchased through a secondary site may offer a return policy. Reviews of the product are strong, with each user experiencing some form of relief from symptoms, although it seems that this product may be more effective for some than others. The blend of herbs and ingredients in this product have been shown to be effective and seem to be of high quality. The lack of product guarantee and somewhat mixed reviews indicate perhaps limited efficacy. Further, the number of capsules required will mean that it will need to be purchased frequently for long-term use, and there are no offers on bulk orders. There is also no indication of a limit of pills to not exceed which may place you at higher risk for side effects. 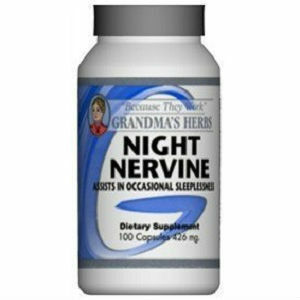 Bernard Spradlin	reviewed Grandma's Herbs Night Nervine Natural Sleep Aid	on November 25th	 and gave it a rating of 3.